Organic Food Bar has several types of bars that are all organic, all healthy, and according to the website, “outrageously good”! The company sent me a few of their bars to try, like the Cherry Pie flavored Bar, and the Apple Pie Bar was purchased. What’s cool about these is a portion of the proceeds spent on the bars goes to support local schools- nice! 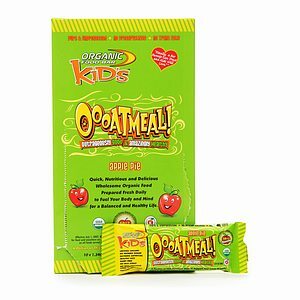 These bars are preservative free, have no trans fats, are unprocessed, no artificial ingredients, are dairy free, and have no high fructose corn syrup or refined sugars. Each bar is a typical breakfast or granola bar size, but these bars do not have the typical texture. In fact, they have a fruity/chewy texture, similar to a PURE bar. Cherry Pie- This one says Oohmega! on the cover, as it provides 1000 mg Omega 3’s per bar. Woop! It was lightly sweetened, almost bland at first. The flavor comes through after you chew it for a bit, and then you taste a bit of cherry. It’s not bad, but it’s a bit off. There are little oat pieces dispersed throughout, and it also has a funky “flaxseed” taste to it. Also, when you hold the bar, you get an oily texture left on your fingers- but the first ingredient is cashew butter, so that’s probably why. What I did like was that there was a delicious cherry chunk in the bar, that added some instant sweetness. Sadly, it didn’t remind me of homemade cherry pie, and I give it 2 1/2. Apple Pie- this one says Oooatmeal! on the cover. I’m not sure why, but this one was much better. It had little pieces of apples dispersed throughout, and the cinnamon was a nice compliment to the bar. It was much sweeter than the Cherry flavored one, and actually did sort of remind me of Apple Pie! I wonder what it would taste like heated up in the microwave… I would eat this one again- 4 stars. Overall, not bad. I’d like to try some of their other bars Organic Food Bar has to offer and give them a shot. I do like that these are unprocessed, contain healthy fats, and are sweetened with agave rather than refined sugar. A nice change to a sugar laden granola bar every now and then! Cherry Pie- 1 bar is 135 calories, 7 grams of fat, 15 carbohydrates, 3 grams of fiber and 4 grams of protein. Apple Pie- 1 bar is 139 calories, 5.5 grams of fat, 19 carbohydrates, 2.5 grams of fiber, and 3 grams of protein.